Bent Paddle Press, 2017, 25 pp., $12. Another poetry / artwork Collaboration between Jeanie & Sharon Auberle. The two exchanged drawings and then wrote poems to each other's art. A superb collaboration! Read some poems and see some of the artwork here. Dancing Girl Press, 2017, 36 pp., $7. Another poetry/story hybrid akin to (Prologue)...see below. Bent Paddle Press, 2017, 30 pp., $12. Limited edition of 126 hand sewn chapbooks with French covers. A blend of grief and beauty and prayer and hope with a touch of the quirky thrown in. Taraxia Press, 2016, 40 pp., $13. Limited edition of 100 hand sewn chapbooks with French covers. In these poems, meet Violet, a disquieting little girl who investigates her surroundings with a clinical eye for the morbid and bizarre. "I’ve loved Violet for years, since reading her first poems. She makes jewelry from dead bugs. Puts chicken hearts in classmates’ valentines. In a perfect world, her universe is drawn by Edward Gorey. She’s like the little girl from The Addams Family—only cooler. Her soundtrack is the stillness after drowning. When Violet’s happiest, her eyes turn black." Concrete Wolf, 2015, 61 p. $10. A poetry / story hybrid thingy with artwork by Judith Bellinghausen Mayer. Winner of the 2013 Concrete Wolf Editor's Choice award. 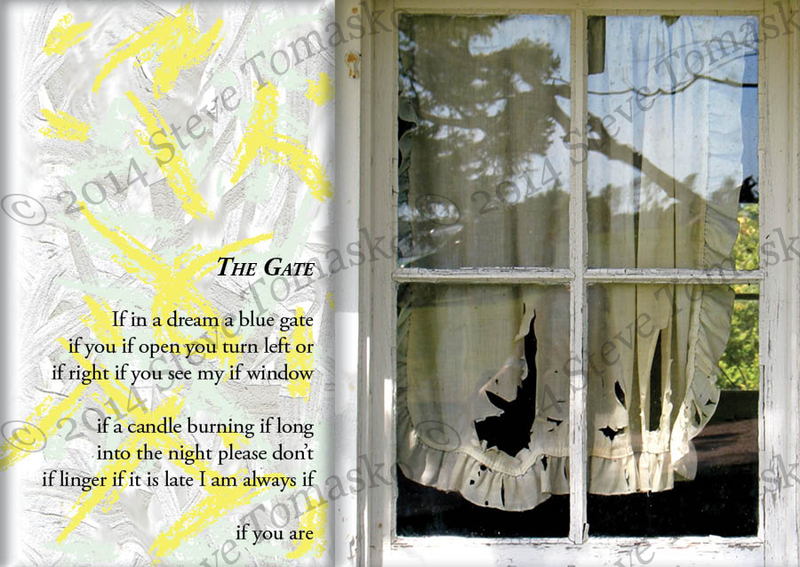 A Poetry / Artwork Collaboration: Poetry by Jeanie Tomasko & Artwork by Sharon Auberle. "...there’s an involvement with nature, a physical, sensory, spiritual involvement ... with the woods and the wind, the birds, the snow, the rivers, the hidden paths..."
"When I began the press a few years ago, my goal was to publish books that married verbal and visual art, to treat both forms with equal respect, and certainly not to to have the art in a book to simply illustrate, but rather, to take the reader/viewer to a place of delicate balance that can only happen, I believe, in that space between two complimentary works. This goal has never been better achieved than it is in Sharp as Want, the work of two brilliant women at the top of their game." —Ralph Murre, Founder/ Publisher of Little Eagle Press. (full review). Parallel Press, 2011, 46 p. $10. "Her poems puncture the skin with poignancy yet leave one with a sense of gratitude for simply being alive. The skin heals over." "In Jeanie Tomasko’s chapbook Tricks of Light, intangibles like love, longing, and spirituality are borne on the wings of birds and bees and illuminated by "'the palest of light / when the nudge from sleep / comes from quiet things, / beckons you out the door, / down the path, / singing songs you used to know.'" Right Hand Pointing, 2012 Free Here! Here's the story: Jeanie stumbled on a book of art by the French painter Raoul Dufy (1877-1953) in a used book store. Perusing the book, she began writing ekphrastic poems based on Dufy's paintings (each poem's title is also the title of the painting it was inspired by). "I should call this series 'Postcards from France,'" she thought. Then thought, "or, just make postcards!" She teamed up with Door County poet/artist Sharon Auberle who looked at Jeanie's poems and paired them with her art. Steve Tomasko designed the cards and voilá — Postcards from France! Well, OK, they're not really from France, but they are postcards! Click on each card for a larger view. Postcards are 4.25" x 6" and printed on postcard stock. $1 each. Go to our store to order postcards.